Size of this PNG preview of this SVG file: 800 × 400 pixel. Resolusyonên din: 320 × 160 pixel | 640 × 320 pixel | 1024 × 512 pixel | 1280 × 640 pixel | 1000 × 500 pixel. Before the rectangular flag was created, Ethiopia flew three coloured pennants. The red was then at the top. Flag of Ethiopia (1897–1914). Menelik II, on 6 October 1897 ordered the rectangular tricolour from top to bottom of red, yellow, and green. Flag of the Ethiopian Empire (1914–1936). The flag with the Lion of Judah (1941–1974). It remains popular with the Rastafari movement and people loyal to Haile Selassie. War Ensign of the Imperial Ethiopian Navy (1955–1974), was based upon the Blue Ensign. Flag of Ethiopian Empire (1974–1975), modified after Haile Selassie's overthrow by removing the crown from the lion's head and by changing the cross tip to a spear point. War Ensign of the Imperial Ethiopian Navy (1974–1975). The official flag under the Derg (1975–1987), essentially the Imperial flag without the lion. It was seen more than the state flag. The State flag under the Derg (1975–1987). Rarely seen, and a forerunner to the flag introduced in 1987. The flag of the People's Democratic Republic of Ethiopia (1987–1991) introduced the current ratio of 1:2. The Civil flag of the Transitional Government of Ethiopia (1991–1996). It is the same as the 1975–1987 official flag, except for the ratio. The State flag of the Transitional Government of Ethiopia (28 May 1992-6 February 1996). 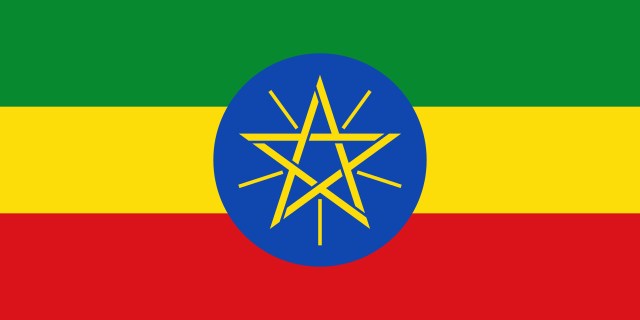 The flag of the Federal Democratic Republic of Ethiopia (6 February 1996-2009). Its central disc is smaller and brighter than in the current flag. Green: "represents the richness and the fertility of our land as well as hope "
Yellow: "represents religious freedom and peace." Red: "represents the sacrifice of our fathers, who spilled their blood in defense of Ethiopia "
niha 14:54, 8 rêbendan 2019 1000 x 500 (818 bytes) FDRMRZUSA Higher svg resolution from same file (by "Inkscape"). Same proportion: 1:2. Optimized code. No other changes.